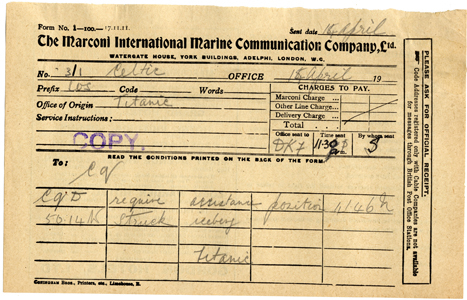 First, here is an image of a wireless distress signal sent that night from the Titanic to the Marconi company. Telegram from the Titanic: "require assistance. . . struck iceberg"
In the decades following its invention, the telegraph became a fact of life and an indispensable tool in business, in the military, and in journalism. Still, it had some drawbacks: it could carry a message, but the contents had to be sent in code; messages could be sent only from one point to another, and those two points had to be connected by a copper wire. For these reasons among others, the telegraph was not a popular means of communication but remained a special tool used mainly by businesses.42 In the late nineteenth century, a flurry of scientific and engineering breakthroughs started to overcome those limitations. In 1876 a Boston University professor named Alexander Graham Bell invented a machine, the telephone, which allowed the human voice to be carried over a wire. Nikola Tesla, a Serbian immigrant to America and the inventor of the alternating-current electric motor, contributed the idea that electromagnetic waves could carry messages. Soon it was proven that such waves could pass through walls. They could scale mountains, even cross the ocean. This created the promise of an amazing possibility: a telegraph without wires! A young Italian, Guglielmo Marconi, became a pioneer in the new field, devoting himself to working on a way to use radio waves to transmit signals carrying Morse code.43 Marconi had the resources to tinker with the idea; his mother was an heir to the Jameson family Irish whisky fortune. Rebuffed at home, Marconi went to England, where he formed the Wireless Telegraph Signal Company in 1897, to be followed by an American division of British Marconi a few years later. In 1901, Marconi even managed to send a wireless signal across the Atlantic Ocean, but he struggled to find a business model for his invention. The early applications of the new technology were in the military and in the shipping business, where the ability to send messages without wires had an obvious appeal. At first the technology was referred to as wireless telegraphy, or simply “wireless,” but a new term—radio—first popularized in the U.S. Navy, soon won out. In 1906 an American inventor named Reginald Fessenden demonstrated that radio signals could transmit more than just long and short pulses. They could carry music and even the human voice. In the end, that discovery proved indispensable for making radio a truly popular medium. One of the first big tests of radio, one that made a lasting impact on the public imagination, came in 1912, when the world’s greatest luxury ocean liner, the state-of-the-art Titanic, made its initial voyage from England to New York.44 As the great ship crossed the North Atlantic on April 14, it struck an iceberg, and the crew immediately used the ship’s wireless equipment to call for help. Some of the other ships in the vicinity had wireless equipment that was turned on and monitored at all times; others had turned their sets off for the night. As a result, Copyright 2012 NOT FOR SALE [ 204 ] CHAPTER 7 the closest ship, the Californian, which could have saved all of the Titanic’s 1,522 passengers, lay at anchor just nineteen miles away and never responded. The Carpathia, which was fifty-eight miles away when the Titanic started sinking, took two hours to arrive, and by then, many passengers had drowned in the frigid waters of the North Atlantic. Rescue efforts were also hampered by the many amateur radio operators who filled the airwaves that night with rumors, questions, and interference from their overlapping signals. In the aftermath of the Titanic disaster, the U.S. Congress quickly adopted legislation requiring that all American oceangoing ships and all those entering U.S. ports be equipped with radios, and that the radios be kept on and staffed at all times. Congress also required radio operators to get a license from the U.S. Department of Commerce, and it relegated amateur operators to the bottom of the radio spectrum (the shortwave end) while giving priority to the navy and to commercial companies like Marconi’s.45 Significantly, Congress chose not to follow the European model, in which new technologies including telegraph, telephone, and radio were successively grafted onto a government monopoly such as the postal service, resulting in public communication monopolies like the BBC. In the United States, Congress operated on the principle that radio would be a private enterprise—regulated, to be sure, but private nonetheless. In retrospect, this was one of the constitutive moments shaping the eventual architecture of broadcasting in America, combining elements of technology, law, and economics into a new model.46 On the night of the Titanic disaster, one of the radio operators in New York handling reports of the sinking was a young man named David Sarnoff. (He was not the only one, as he often claimed.) A Russian immigrant who never made it past the eighth grade, Sarnoff would become one of the titans of broadcasting in the twentieth century as president of RCA, the Radio Corporation of America.47 While working for Marconi, Sarnoff demonstrated great foresight. In 1915, when he was just twenty-four years old, Sarnoff wrote a memo to his boss, giving his thoughts on the business. He envisioned a future for radio that went far beyond transmitting coded messages from point to point. “I have in mind,” he wrote, “a plan of development which would make radio a ‘household utility’ in the same sense as the piano or the phonograph. The idea is to bring music into the home by wireless. . . . The same principle can be extended to numerous other fields as, for example, receiving lectures at home which can be made perfectly audible; also, events of national importance can be simultaneously announced and received.”48 Sarnoff projected a market of 15 million American families. The Marconi company did not think much of Sarnoff’s scheme, but Sarnoff clung to the idea that radios could be a popular mass commodity, provided they became easier to use. Never much of engineer, Sarnoff was already showing his true talent: marketing. He switched to management. While Sarnoff and others were pondering the future of radio, most Americans Copyright 2012 NOT FOR SALE Jazz Age Journa lism, 1920–1929 [ 205 ] still had never heard a radio broadcast. A few license-holders were beginning to transmit signals through the airwaves (or into “the ether,” as it was called), where they could be heard by anyone with a receiving set. But hardly anyone had one yet. A few corporations, such as United Fruit, were using radio to coordinate their shipping fleets. And of course the army and navy remained deeply involved in radio. But before about 1920, radio remained largely in the hands of the amateurs— most of them young men who were inclined to tinker. Those early adapters usually built their own radio sets. They set up friendly competitions to see who could pull in the faintest or most distant signal (which they called “DXing”). They often traded information and parts in a wave of enthusiasm that had nothing to do with patents, profits, or licenses. Participants in the new movement sometimes referred to what they were doing as “citizen radio.”49 An editorial in one of the first radio journals put it this way: “Do you realize that our radio provides about the only way by which an individual can communicate intelligence to another beyond the sound of his own voice without paying tribute to a government or a commercial interest?”50 Soon others joined in—women as well as men, universities, stores, even the famous Dr. Brinkley of Kansas, who used radio to promote his theory that implanting goat glands would cure “male trouble.” Radio was wide open— diverse, local, nonprofit, and utterly unpredictable. But not for long. World War I transformed radio, as it did so many other institutions.